This size unit is perfect for storing an entire bedroom or office. Are you looking to remodel a room or office? Now you can have the space to keep all of the contents during construction instead of clogging up other rooms! In-between homes and need to store all of your family’s belongings? This is the perfect space for you, capacitating roughly 5 bedrooms, and larger items like washers, dryers and refrigerators or vehicle/boats. This unit has over 200 square feet of space, ideal for a 5 to 7 bedroom house, easily storing entertainment centers, refrigerators, beds, couches, and more! Now this is some serious storage! This unit is ideal for a 5 to 7 bedroom house, easily storing entertainment centers, refrigerators, beds, couches, and more! 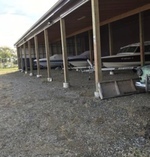 Storage for boats, campers, vehicles. Electricity in each unit. Perfect for boat, RV, recreational vehicles or a large household. Vehicle storage $30 anything over 30ft is a $1 per ft.
** "Had a great experience renting from D & H. Clean and employees are helpful and always available. We will go back if we ever need storage again!" -Dani M.